During premenopause, the period of time from the first menstruation to menopause, many women experience a variety of symptoms due to hormone fluctuations. Most commonly occurring just before a woman's period, premenopause is better known as premenstrual syndrome (PMS). Read on to discover more about symptoms of premenopause and how to combat them. Although severe psychological or physical symptoms of premenopause might need medical attention, most mild to moderate symptoms can normally be managed through simple lifestyle changes. While changes in routine can seem daunting, the effort put in will help prevent symptoms rather than having to deal with them when they arise. 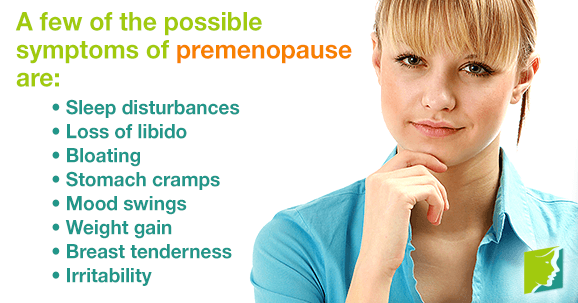 Below are some tips on how to combat premenopause symptoms. A diet high in processed and high-sugar foods and lacking in nutrients will worsen many of the psychological and physical symptoms of premenopause. Additionally, salty foods can increase bloating, a common premenopausal symptom, so avoiding them is recommended, as well. Complex carbohydrates - found in fruits, vegetables, and whole grains - should be one of the main staples of your diet. Fruits and vegetables are also rich in many of the vitamins and minerals that ease premenopause symptoms. Fatigue can often worsen existing irritability, sometimes leading to irrational thoughts and mood swings. However, sleep can be difficult during premenopause, since many of the symptoms can hinder sleep. Regardless, good sleeping patterns are essential for managing premenopause symptoms. Keeping a good exercise regime, avoiding caffeine before bed, and keeping your room cool and dark are all ways to help with insomnia. Stimulating blood flow to the muscles will reduce the intensity of menstrual cramps, so keeping a regular exercise regime will help prevent the onset of this premenopause symptom. Exercise also releases endorphins and serotonin into the brain, elevating mood. At least 180 minutes of aerobic activity each week is recommended. Stress can affect the hormonal balances within the body, increasing the chances of experiencing premenopause symptoms. Decreasing stress will not only reduce the intensity of physical symptoms, but it can also help combat many of the psychological side effects of premenopause, such as anxiety, irritability, and mood swings. Therefore, building some relaxation time into your life is recommended, even if it is 10 minutes for a breathing exercise, reading a book, or joining a weekly yoga class. Premenopause lasts for many years, and the symptoms can be uncomfortable. However, with a common sense approach to lifestyle and general health, premenopause need not be a time of discomfort and anguish. Although some women might require additional treatment, many find that healthy living is sufficient to manage the symptoms. If you are suffering from irregular periods in premenopause, then you might be confused or even worried. This article discusses how normal they are. Some women suffering from premenopause symptoms worry about whether what they are feeling is normal.